VP nominees Tim Kaine (D-VA) and Mike Pence (R-IN). "Neither of you[r parties'] economic plans will reduce the growing $19 trillion gross national debt," she said. "In fact, your plans would add even more to it. Both of you were governors who balanced state budgets. Are you concerned that adding more to the debt could be disastrous for the country?" Both candidates used tactics to artfully evade Quijano's question. Pence noted that Hillary Clinton was part of an administration that doubled the national debt and said he was "very proud" that he is from a "state that works," praising his efforts in Indiana for cutting taxes. Kaine gave a canned response: "Do you want a 'you're hired' president in Hillary Clinton, or do you want a 'you're fired' president in Donald Trump?" he asked, before arguing that by making college tuition free and raising the minimum wage, Clinton is the right choice for the economy. Your taxes are going up, no matter which one of these tickets wins on Nov. 8. The U.S. national debt is an issue that is often discussed in debates, but with very little information divulged on how it will affect America's largest demographic: the middle class. The national debt ceiling was suspended in October 2015. This allowed the government to spend at will. The U.S. national debt soared more than $700 billion the month of November 2015 alone, reflecting pent up borrowing needs of the federal government that had gone unfulfilled for months. 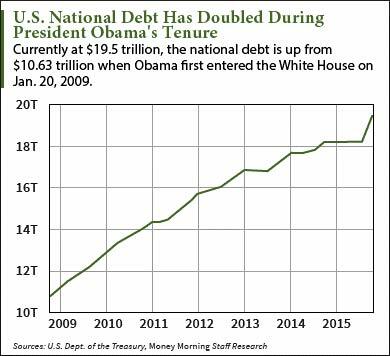 Just this past August, the national debt hit $19.5 trillion – $10.63 trillion more than when President Barack Obama first took office in January 2009. This new massive debt load means that, no matter who the next president is, he or she will have to raise taxes in order to reduce what the United States owes. To achieve this, Congress will have to devise plans to raise revenue through tax hikes and spending cuts. Increasing revenue, however, will prove difficult because if you tax high-income individuals too much, they might relocate to a more tax-friendly country, such as Thailand, where a resident is only taxed on what he earns locally. This means that a U.S. millionaire living in Thailand but earning money through various ventures overseas would only be taxed there on what he makes locally, which could be nothing. And you can't tax the poor, because, well, they have nothing to give in the first place. However, both candidates have tried to assure voters time and again that their plans for government spending and saving will keep the debt burden at bay from middle-class America.